You might walk up and down it every day, but you probably don’t know what every part of your staircase is called. And for the most part, why should you? But the world of staircase design has its own language, and if you have a staircase renovation project or you want to create a brand new bespoke staircase for a property, it helps to know a bit of the lingo. 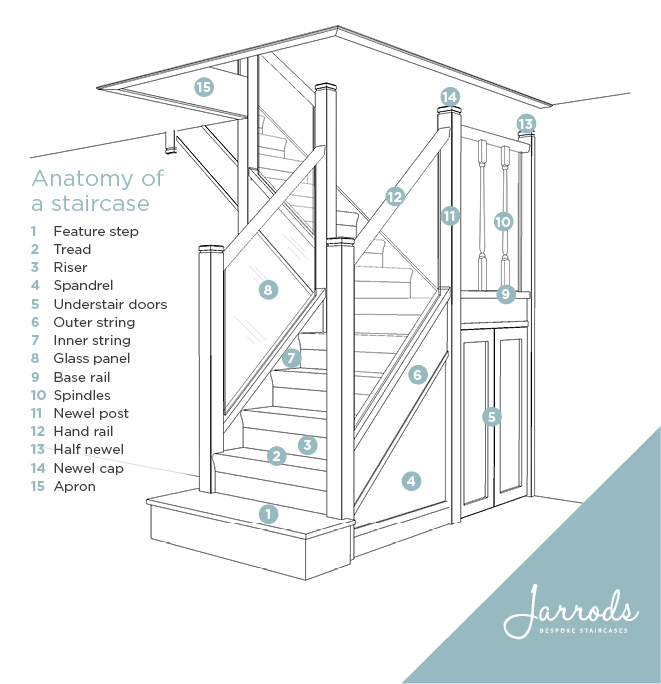 What you need is a simple, straight-forward glossary that explains the anatomy of a staircase that’s understandable and uncomplicated. Luckily, that’s precisely what we’ve put together. Whether you want a modern metal staircase or a traditional wooden staircase, from contemporary glass to classic wrought iron, here’s our handy guide to staircase terminology. The first step of your staircase, also known as a curtail or bullnose step, can be made into a feature step that’s slightly wider than the rest. When one or both ends are in the shape of a scroll or spiral it’s sometimes known as a scroll step. It will usually hold the bottom newel post. The tread and the riser make up the steps of your staircase. The tread is basically the part that you step on and it can be made from wood or glass. Depending on the kind of staircase you have, the riser is either the solid section upon which the tread sits, or a space between steps. A glass sub-riser can give the stability of a solid riser but look like there are gaps between the steps. A panel that fills the triangular area formed by the underside of a string. This can sometimes be used to create an under-stairs cupboard. As well as the spandrel, any other area beneath the string and the lower floor level can be adapted into storage space. The strings are the sections that hold the treads and risers to the main structure of the staircase. Depending on its placement in your home, you may either have a solid outer string or a cut string on the outside of the staircase. This is the inside face of an outer string and a wall string is, as you’d expect, attached to the wall. The hand rail can be supported by a solid panel. To maximise light this will often be made of glass. The alternative to a panel is using spindles, more on those later. Parallel to the hand rail and running up the base of the stairs, the base rail is where the spindles, balusters or glass panels at the side of the staircase are fixed into. Thinner vertical supports are known as balusters or spindles and can be wooden, metal or glass. These give extra support to the hand rail and add an extra decorative feature. A vertical post at the start of the staircase and at points where the staircase changes direction. These provide the main support for the hand rail. Sitting on top of the balusters or glass panels and into the side of the newels, this is the part of the staircase which supports you while walking up and down. It can be wooden, metal or even glass. An upright post that is used to terminate the hand rail into a wall or column. This is an ornamental feature on the top of a newel post that can be any material or style that matches, complements or contrasts with the style of the staircase. At Jarrods we can even carve a design into the wood for you. When a stairwell opening is created, the joists and trimmers of the upper floor that it connects with are exposed. The apron is a timber board that covers this area and connects with the ceiling line. If you want to find out more about how you can customise each part of a staircase to make it truly bespoke, feel free to get in touch with us.